Breakfast is usually a rushed affair for me and means something quick with my morning coffee. It's not quite grab-and-go as I hate eating on the run. However it does mean no cooking and it has to be strong enough to kick start the day alongside the coffee (and believe me when I say I need a good kick-start to get going especially when I'm as fast as molasses on a Monday morning). Since making my own yogurt, its been a regular breakfast staple. To save on washing, I confess to eating it straight out of the bottle. Oops. 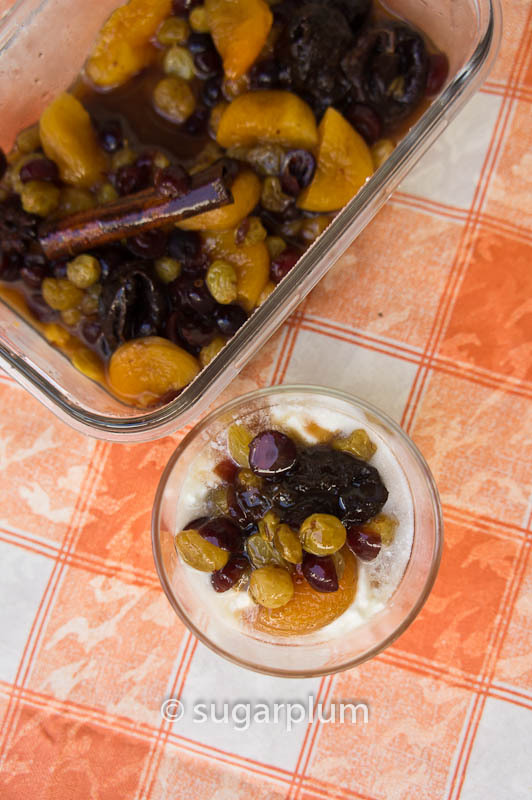 To jazz up the yogurt a little, I decided to make some fruit compote and add it to the yogurt as a topping. This was actually inspired by breakfast at Galaxy Hotel, Macau. They had tiny pots of plain yogurt alongside equally tiny pots of fruit compote - apple, pear, rhubarb and apricot. 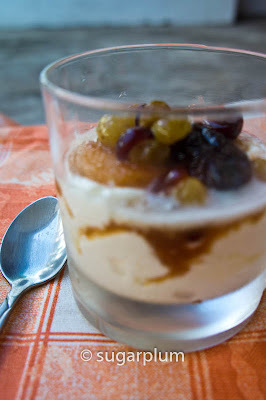 Really prettily served in little glass jars so you can see the fruit and syrup. Most compotes are simply cooked fruit in a syrup. 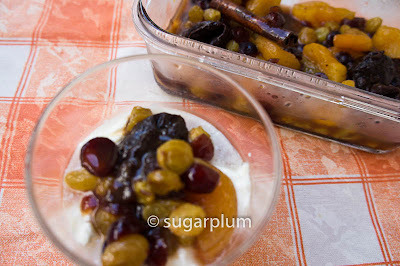 I decided to use the same dried fruit topping I use for my usual yogurt - dried apricots, cranberries, raisins and prunes. You can use your favourite combination. And to make the flavours a little more intense, I used a ginger honey syrup, spiced up with cinnamon, star anise and cloves. A really heady aromatic mixture. Mmmmm.... it smelled great as it was cooking up. Plus ginger is reputed to be a good stomach-settler due to its 'warming' properties. Cook up a batch to last you over the weekday breakfasts, serving it over yogurt or oatmeal. Or serve it as a dessert over vanilla ice-cream (ooh, decadent) or on its own. Deelish. 1. Place all the ingredients into a pot and bring to a boil over medium heat. Make sure the fruits are immersed in the water. 2. 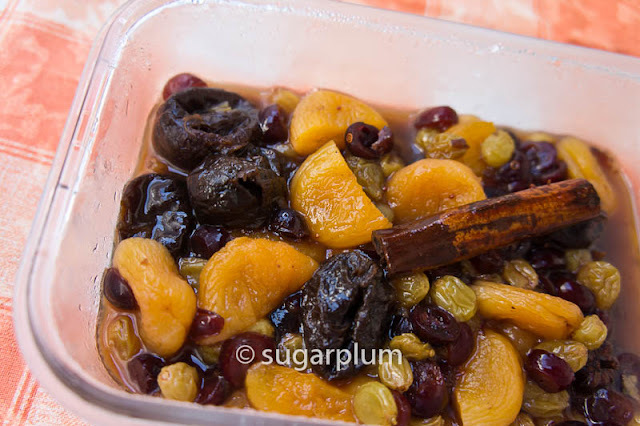 Reduce heat and gently simmer until fruits are plump and syrup is of the desired consistency. I wanted a really thick syrup to spoon over yogurt, so I cooked my syrup down to about 1/4 cup. 3. Cool before storing in a non-reactive container. Store compote in the fridge for up to 1 week. If you can't find ginger honey concentrate, make your own. Take a knob of fresh ginger (about thumb size), clean it and smash it with the back of your knife. To the cup of water, add 3 tablespoons of honey and the smashed ginger. If you want a more intense ginger flavour, pound the ginger and squeeze out the ginger juice before adding it to the water. Here's the link to homemade yogurt.